Accumulating evidence points to runaway rates of “vaping” of nicotine among youth, now characterized as posing unknown risks and as an epidemic warranting investigation by the Food and Drug Administration (FDA) who last year announced plans for promotion of e-cigarettes as harm reduction, a strategy endorsed in the nation’s leading medical journal. And is increasing rates of youth who will smoke tobacco. Endorsement of the FDA plan in the Journal of the American Medical Association (JAMA) cited a small downward shift in vaping by youth over just one year- 2016. But as described in new reports in the online news source Vox and increasingly elsewhere, more recent data point to booming use of e-cigarettes among youth, that use increasing likelihood of young people starting to smoke (tobacco) cigarettes. 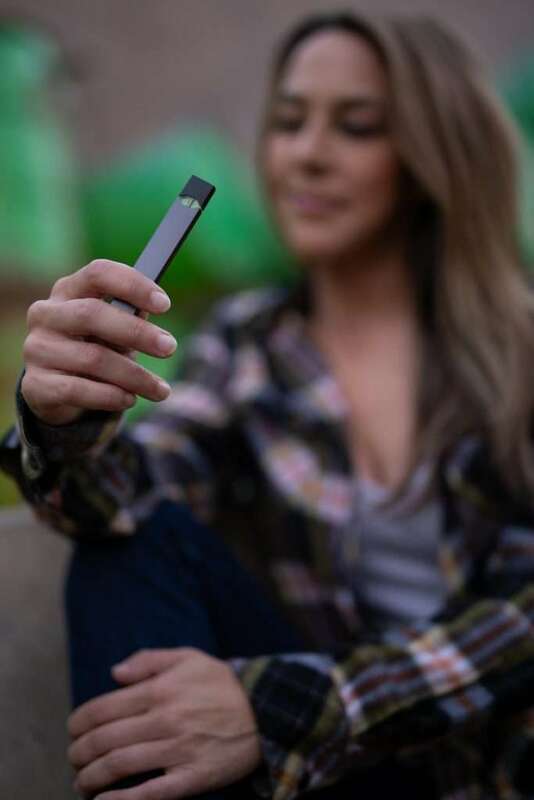 2) Instead of switching to e-cigarettes as a substitute, use of e-cigarettes does not appear to decrease prevalence of tobacco use among adults – leaving the question of effectiveness and wisdom of the e-cigarette harm reduction strategy unanswered. the FDA/Medical Industry plan and endorsement for vaping as effective harm reduction relied on an irresponsibly limited data base; was not grounded in a research base adequate to support confidence in vaping behavior as reducing use of tobacco overall or confidence in vaping health effects as significantly benign compared to those for tobacco; and ignored the direct links among nicotine, risk of onset of type 2 diabetes, and increasing rates of diabetes among youth. Nicotine, an addictive substance, may be delivered in vape devices in concentrations as high or higher than in regular cigarettes. The delivery and behavioral nature of vaping and smoking predict higher potential for conditioned psychological dependence. To a greater degree than other substances, the bioactive delivery of nicotine vaped or smoked, and the comforting behavioral ritual, are repeated many times each day, with each inhalation, up to hundreds of times each day. That is, the cycle of felt need or compulsion to deliver the mood-altering substance, its delivery by inhalation – and the rewarding sensory/mood alteration are repeated many to hundreds of times each day. That’s a lot of positive reinforcement of the behavior. From research and findings linked to in this follow-up post, accumulating evidence heightens concerns pointing to unknown risks of vaping for adults and especially youth, and known risks in the context of apparent rapidly increasing use of vaping among youth. For example, teens who start vaping are more likely to continue than to quit, and more likely to start smoking tobacco; vaping may not help cigarette smokers quit; and surveyed, non-randm samples of youth and adults who have started vaping have indicated little motivation to stop. And congruent with accumulating evidence pointing to a gateway rather than proactive link from vaping to cigarette use and nicotine dependence – illustrated here, new CDC data appear to point to an uptick in teen use of cigarettes this year (from 2017) by 7%, after decades of decline concurrent with the sharp upturn in vaping over past years. Now it appears that France has joined the U.S. and Canada for the alarming and predictable trend. Vaping there has increased among youth since its introduction and marketing began a decade or so ago. More recently, epidemiological data on vaping among youth and adults at risk of increasing use of tobacco cigarettes and nicotine dependence was released by the American Academy of Pediatricians. 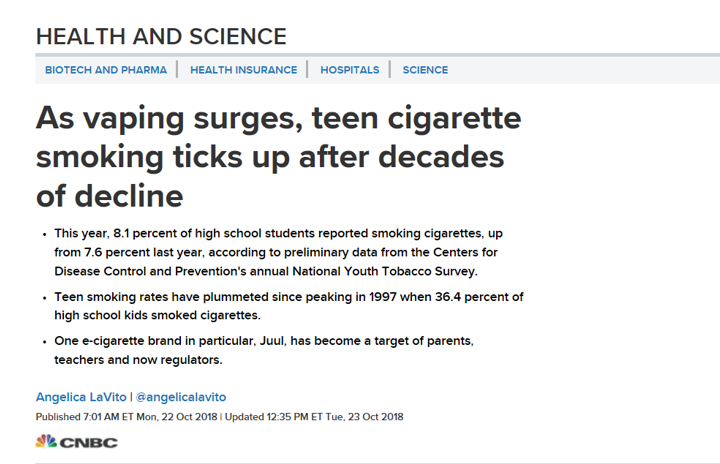 Remarkably, the esteemed Academies and Medical Industry reviews and recommendations along with media analyses of results, policy, and implications for public health have not yet addressed the concurrent public health epidemics directly impacted by proposed use of an FDA vaping promotion campaign –childhood and adult diabetes epidemic fueled partly by nicotine use. 3) the diabetes public health epidemic described as posing the greatest risk to public health , looming and fueled by increased latent risk from a childhood obesity epidemic. Now, independently in the U.S., Canada, and France – epidemiological data predicted by those results and links contribute to evidence of failed outcomes, again, for medical industry harm reduction fixes for the non-medical problem of compulsive substance use. As vaping – not long ago endorsed in the nation’s leading medical journal as a form of harm reduction – booms among youth, concurrently historical trends in decreased use of tobacco smoked in cigarettes now appear to be reversing and apparently increasing in those three populations. The congruence of those trends with the accumulating evidence pointing to a gateway rather than proactive link from vaping to cigarette use and nicotine dependence appears to form another disturbing example of medical/pharmacologic fixes for non-medical problems, predicting harm. More than four months ago, the predictable, disturbing trend in reversing incidence of youth cigarette smoking – after decades of decline and associated with booming vaping – was reported on and discussed here. It took four months for major media to pick up on the lethal trend, and without examination of the similar trends in Canada and France. Regularly, new evidence mounts confirming that instead of a protective effect, booming vaping among youth acts as a “gateway”, increasing likelihood of initiation of use of tobacco by smoking (cigarettes). Playing a key role in creation of the epidemic, media reporting on vaping and its consequences for public health evidence the same remarkable incompetence, ignorance and craven service to Medical and substance delivery industries as in major media collaboration with Big Medicine, Big Pharma, NEJM, others to message the lethal fabrications enabling the opioid crisis. A recent egregious and illustrative example, described in this recent post, in which ignorance of and inability to integrate critical thought with understanding of the most basic of concepts of experimental design – the control group in a randomized controlled trial (RCT) – generated unsupportable conclusions about effectiveness of both nicotine replacement therapy (NRT) and vaping for cessation of smoking (of tobacco cigarettes), those constructed, unsupported distortions promoted on major media, then knowingly and enthusiastically endorsed on social media by academics, professionals, popularizing writers, others. Turns out, based on trends and accumulating evidence, that encouraging adults and kids to believe in the safety of vaping a highly addictive substance directly linked to looming diabetes epidemics and with unknown health risks was a really, really bad idea. As bad an idea as continuing to encourage smokers to believe that nicotine replacement therapy = NRT (like nicotine patches), and prescribed medications to stop smoking are effective, in the face of evidence establishing no or insignificant benefit, and predicted increased risk for relapse – those outcome failures contributing to the opioid crisis through the effects of nicotine and smoking on chronic pain and problem use of alcohol and opioids. As bad, potentially, as the runaway prescription, against all lines of longstanding available evidence, of highly addictive opioid pain medications for centralized (common) chronic pain, an entirely non-medical, psychogenic problem, with no indicated biomedical treatments instead indicated evidence-based, durable psychotherapy (CBT) interventions. 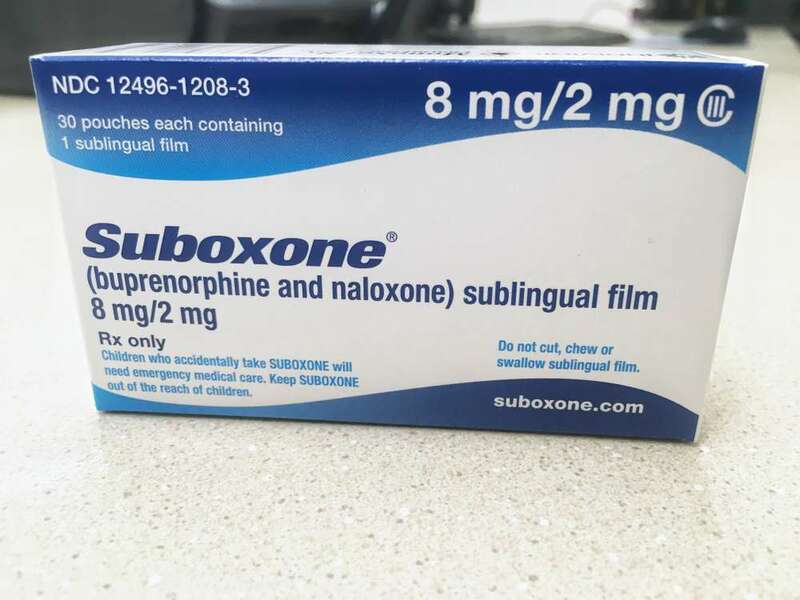 As bad an idea as continuing to implement and falsely promote prescription and provision of substitute opioids of abuse without associated evidence-based treatment, as a “fix” and “gold standard” for that generated, iatrogenic opioid crisis. 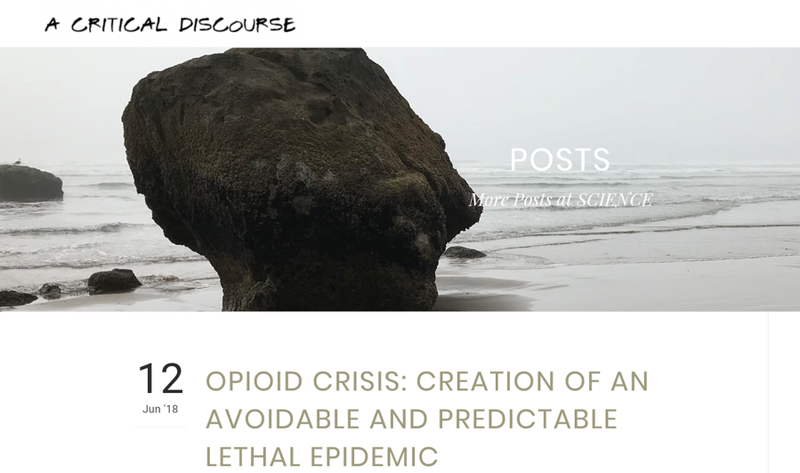 While evidence mounts that the associated national opioid epidemic is worsening, including diversion, abuse, and increasing association of those prescribed opioids in overdose deaths. As bad as continuing to promote a fictional model of “addiction” as a medical condition, “disease of the brain” invalidated by all relevant lines of longstanding evidence, diverting decades and billions of dollars of public healthcare resources away from evidence-based treatments, while national substance use epidemics worsen. Diverted on the false and lethal promises of magic pills just around the corner, for vulnerable Americans trapped in substance use problems. Of cultural and institutional pathology.